The rumored Arrow/Flash spin-off is rumor no more. The CW Network officially added it to the upcoming Fall season and the name is indeed 'DC's Legends of Tomorrow.' It'll feature heroes and villains from both shows coming together to fight against an enormous threat. Arrow and Flash executive producers Andrew Kreisberg and Greg Berlanti, as well as Arrow creator Marc Guggenheim and Sarah Schechter will be running the show.The star-studded cast includes Brandon Routh (Ray Palmer/The Atom), Wentworth Miller (Leonard Snart/Captain Cold), Dominic Purcell (Mick Rory, Heat Wave), Victor Garber (Martin Stein/Firestorm), Ciara Renee (Kendra Saunders, Hawkgirl), Franz Drameh (Jay Jackson) and Caity Lotz. Although it’s still unclear what role Lotz will play considering her character on Arrow died. Berlanti has become the go-to guy for superhero television. He will have four superhero programs on the air next season after CBS announced the series order of Supergirl.DC Comics/Warner Bros. currently has Arrow, The Flash, Supergirl, iZombie and Gotham on television. Constantine is holding on to hope that NBC will renew it at the coming upfronts. The studio also has Titans and Lucifer in contention at other networks. With Marvel's Agents of SHIELD on ABC (Agent Carter still up in the air for renewal) and the recent success of Daredevil on Netflix earned itself a second season on top of the three other series coming with a team-up to follow. This really is the golden era of comic book TV. DC’S LEGENDS OF TOMORROW stars Victor Garber (“The Flash,” “Alias”); Brandon Routh (“Arrow,” “Superman Returns”); Arthur Darvill (“Doctor Who”); Caity Lotz (“Arrow”); Ciarra Renee (“Pippin”); Franz Drameh (“Edge of Tomorrow”); with Dominic Purcell (“The Flash,” “Prison Break”); and Wentworth Miller (“The Flash,” “Prison Break”). 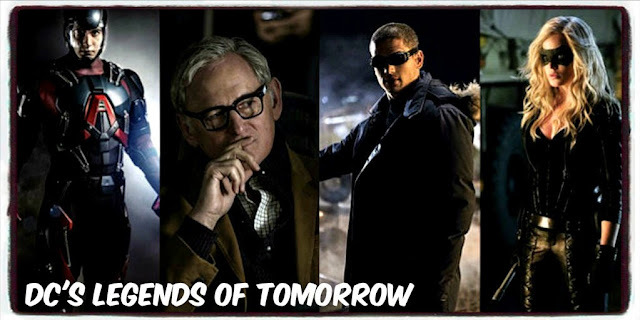 Based on the characters from DC Comics, DC’S LEGENDS OF TOMORROW is from Bonanza Productions Inc. in association with Berlanti Productions and Warner Bros. Television, with executive producers Greg Berlanti (“The Flash,” upcoming “Pan”), Marc Guggenheim (“Eli Stone,” “Percy Jackson: Sea of Monsters”), Andrew Kreisberg (“The Flash,” “Eli Stone,” “Warehouse 13″) and Sarah Schechter (“The Flash,” upcoming “Pan”).